Greg is in Kindergarten. Watching that kid learn how to read is one of the most exhilarating experience of my life. Being there as he starts to "get it" and realizing that he'll be smarter than me in less than three years is wild. Upon looking at the drawing, you can see Jesus prostrate, floating above the fires of Hell. And he's got a smile on his face. Underneath all that is some text in Greg's handwriting. At first glance the words seem to sound out, "Pay By the Fire." This is a technique in Kindergarten they call "inventive spelling." They let the students write sentences, sounding out the words and writing how they think they should be spelled. As backwards as that sounds, it seems like it has been working. As for Greg and this drawing, we spent $12,000 on therapy and $25,000 on an exorcist. Finally we asked Greg what the drawing was about and he said that he liked playing soccer by the fire. "Play by the fire?" Yes, play by the fire. Now we are spending $300 at the local OU branch campus to teach the boy perspective drawing. Hehe... Now how much of this is true? The drawing is real and that he is playing soccer by the fire. That we thought it was Jesus was real. Everything else is pretty much made up. 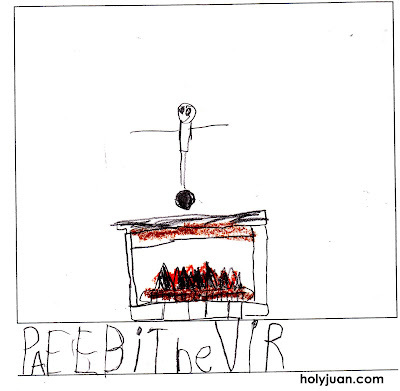 Oh, inventive spelling is correct. Damned, dude. My crayon rorshachs were just on the refrigerator -- not the internet.